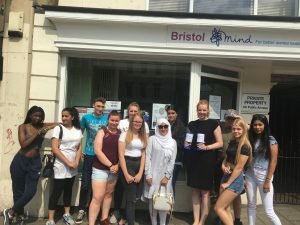 As part of their social action project, groups of 16 year olds from National Citizen Service (NCS) have chosen to raise money for Bristol Mind. NCS Group 3 held a bake sale and sponsored bike ride from Bristol to Bath and raised over £300. Bristol Mind would like to thank both groups for raising such amazing amounts of money! Kim Dean, Bristol Mind General Administrator, pictured receiving the donation from NCS Group 3.